Sure, it may be less than a month until the 2012 season, but with the installation of a new four-team playoff structure this off-season (set to begin in 2014), it is as good of a time as any to ponder what teams should have made the playoffs in the 15 years of the BCS’ existence. Nearly every year one or more teams are left complaining about the final polls not falling in their favor. Now there are only two more seasons to endure the BCS structure before college playoffs begin, two more years of a team or two getting robbed from their shot at a title. This series leading up to the kickoff of the 2012 season will feature a mock playoff from specific years when the BCS system seemed to get it all very wrong. Based upon the team’s record and players, we will simulate who would have played whom and come out victorious had the playoffs existed from the get-go, starting with the 2000 season. This will focus only on controversial BCS national championship games, explaining what could have happened had there been a playoff. *We would like to clarify that we are using the AP poll rankings to decide to seeds in these playoffs, not the BCS rankings. All playoff games are simulated using a first-time Whatifsports.com game simulation to determine the outcomes. For part 1’s look at the 2000 season’s proposed playoff, click here. 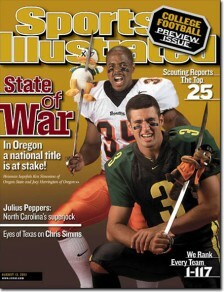 Any discussion about controversial BCS national championship games would be incomplete without a mention of the notorious Oregon snub in the 2001-2002 season. 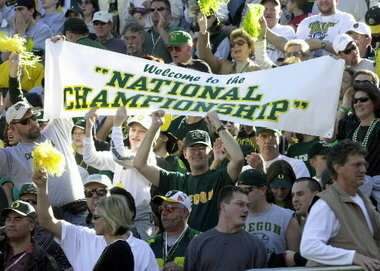 More than 11 years later, that game remains a sore spot with all Oregon fans, and is unquestionably the automatic response for most-lopsided or uneven BCS National Championship matchup. It was an odd year, as the horrible events on September 11th led to a national week of mourning, with all games postponed. When football resumed teams were left scrambling to juggle the schedules to make up for the lost week with no games, some teams never recovered. The ability of hindsight proved that the BCS got it very wrong that year, with Miami and Oregon proving to be the two most dominant teams in the country. Alas, Oregon never got their shot to prove the critics wrong, as despite being ranked #2 in every human poll, the computers thought otherwise, selecting Nebraska. The Nebraska Cornhuskers didn’t even win their own conference that year, that designation went to Colorado, who after losing two games early in the year were anointed the hottest team in the country by the media, obsessed with their impressive back-to-back wins over previously-undefeated Nebraska and Texas in the Big-12 Title game in impressive fashion, trouncing Nebraska 62-36, signaling effectively the end of the heralded triple-option era of the Cornhuskers that had led to so much success for decades. The loss dropped Nebraska to #4 in the human polls, yet somehow the BCS formula at the time kept Nebraska at #2 in the BCS, with a two-loss Colorado team at #3 and Oregon despite its #2 human poll ranking across the board being left behind at 4th in the BCS. Nebraska, after being completely exposed by Colorado, put up little if any fight against the Miami Hurricanes in the BCS Championship game, while Colorado and Oregon were left to play the consolation Fiesta Bowl. There were murmurs of a split-national title should Nebraska win, but despite Oregon’s annihilation of “the hottest team in the country” 38-16, there would be no split, forever leaving Oregon fans and players to ask what-if, how might the BCS Championship turned out if they were given their deserving shot at Miami? Miami players getting ready to huddle. The first team up in our hypothetical playoffs are the Miami Hurricanes, who started the season ranked #2, behind Florida. The Hurricanes opened the season at Penn State and coasted to a 30-0 halftime lead, eventually a 33-7 victory. Returning Heisman Trophy contender, quarterback Ken Dorsey, announced his return at the helm by completing 20-of 27 passes for just under 350 yards. Next up was ex-Miami defensive coordinator and new Rutgers head coach Greg Schiano, handing their former companion a 61-0 loss, forcing eight fumbles against the over-matched Scarlet Knights, elevating Miami into the #1 spot in the polls. Miami seemed like an unstoppable freight train,loaded with talent that would become the most players selected in the first round to the NFL draft from a single school in history. Things were rolling for the ‘Canes, and it seemed like BCS or bust for this squad. Next Miami visited Pennsylvania for the second time when they played Pittsburgh, the Hurricanes riding star running back Clinton Portis for 131 yards and a career best three touchdowns on their way to a 43-21 win. But then Miami showed their weakness, the inability to play up to their potential against every opponent. Looking lackadaisical, sleepwalking through the game expecting their overwhelming talent to deliver an automatic victory, the Hurricanes struggled against little Troy State, a first year division 1-A team. Troy State stayed neck-and-neck with Miami throughout the first and much of the second, but late Miami gathered themselves and scored in quick succession to give a deceptive final score in a game that was MUCH closer than the box score made it appear, 38-7. Perhaps embarrassed by the subpar showing vs. Troy State or more likely simply overlooking the opponent, the Hurricanes got their chance at redemption by facing bitter rival Florida State. There was no need for another infamous wide-left/wide-right moment in the closing seconds this time, Miami cruised to a 49-27 stomping of the Seminoles. The win ended Florida State’s decade of dominance at home, and bringing a halt to the Seminoles NCAA-leading 54 game home win streak. Easy victories over West Virginia and Temple had Miami clearly in the driver’s seat for the national championship, some in the media declaring the team unbeatable. No team was thought to be able to compete toe-to-toe with the might of the Hurricanes, but the perception would prove all too faulty, as Miami’s luck was the only thing keeping the ride alive. Miami’s seven-game win streak was put to the ultimate test upon facing Boston College. A sluggish Hurricanes team were stunned by the BC squad, dominating the supposedly unstoppable Miami team in all facets of the game. A tough defensive struggle left Miami with four field goals, and four interceptions thrown by Dorsey, precariously hanging on to a 12-7 lead with Boston College driving to the endzone as time was about to expire, and with it Miami’s dream season likely coming to an end. As the final seconds ticked off the clock, Boston College’s pass was tipped and intercepted by Miami All-American safety Ed Reed, and returned almost the entire length of the field for a defensive touchdown, 18-7 final score. Miami escaped, but barely. They would be tested once more during the season, against the Michael Vick-led Virginia Tech Hokies. Va Tech again found the formula to slowing the vaunted Hurricanes, stymieing Dorsey and co. for much of the day in a hard-fought game, again Ed Reed proving the hero with a game-saving late interception. But Virginia Tech still had an opportunity to defeat Miami, but a dropped two-point conversion by a wide-open receiver preserved Miami’s perfect season, escaping with a 26-24 win. The Hurricanes ended the season ACC Champions, undefeated, undisputed as the #1 team in the country. They would be bound for the BCS National Championship, the only question was whom to play? Nebraska drew the BCS straw to take on Miami, and gave little resistance to the Miami football machine, getting demolished soundly by the Hurricanes in the Rose Bowl in one of the worst national championship blowouts ever, 45-7. Coming off Oregon’s victory in the 2000 Holiday Bowl, the hype for the 2001 season started early, with a massive billboard overlooking Times Square in New York declaring senior quarterback Joey Harrington “Joey Heisman.” The Ducks lived up to the hype and more, as from the first win of the season, a close victory over Wisconsin 31-28 at home in a last-minute comeback that would become Harrington’s M.O. garnering the nickname “Captain Comeback,” Harrington proved even the most ardent nefarious doubters wrong. Close games continued, as a difficult battle with USC ended with Oregon the victors, despite USC QB Carson Palmer throwing for 411 yards, but Oregon cornerback’s interception hat trick giving Harrington just enough of an opportunity to make the Trojans pay. Another late drive culminated in a game-winning field goal for kicker Jared Siegel, earning Harrington’s 8th career 4th quarter comeback. The Ducks’ next three games gave their fans a chance to relax, outplaying Utah State, Arizona and Cal by a combined 149-56. With Miami’s victory over Florida State the week before, Oregon now possessed the nation’s longest home winning streak at 23…it wouldn’t last. Stanford came to Eugene, and despite an injury to starting quarterback Randy Fasani held strong, though Oregon appeared to be well on their way to another win going into the 4th quarter with a 42-28 lead. However, two blocked punts and an interception later, and Stanford made a miraculous come-from-behind victory, winning 49-42, leaving the Autzen crowd stunned and silent. The dream season appeared over, Oregon’s shot at the national title dashed as it seemed unlikely that Miami or Nebraska would lose a game all year. A trip to Washington State required every bit of running back Onterrio Smith’s record-setting 285 yards rushing to eek out a victory on the last play of the game 24-17 vs. the undefeated WSU Cougars. Another late victory would come two weeks later, escaping UCLA with a 21-20 win. Almost an entire month would pass before Oregon’s final regular season game, hosting the annual Civil War vs. hated rival Oregon State. To host a national TV audience, the game had been pushed back to December 1st, the first time in school history a regular season game was being played in December. Severe Oregon weather would turn it into a defensive struggle, dashing Harrington’s legitimate Heisman Trophy hopes, as the nation looked on at a field goal fest in the pouring rain and ineffective offensive output, the Ducks trailing 6-3 in the 2nd half. But just like all year with the exception of the Stanford game, when things looked dire, somebody stepped up making a game-changing play. This time it was star wide receiver Keenan Howry, returning a low punt untouched for a touchdown to give Oregon its first lead 10-6. The weather turned worse (say it with me–“it NEVER rains in Autzen Stadium”), making it nearly impossible to play on the slick field. A late touchdown run by Maurice Morris gave Oregon a 17-6 lead, but an OSU score and Harrington fumble gave Oregon State a shot to steal it. Again, when things seemed on the verge of collapse Oregon’s playmakers stepped into the limelight, as senior cornerback Rashad Bauman got his first interception of the season, sealing Oregon’s victory and Pac-10 title. The Ducks finished #2 in every human poll, but with Colorado’s string of success the Ducks were leapfrogged in the BCS rankings, pushed back to #4 in the computer formulas behind Nebraska and Colorado. Colorado did not realize what it was facing when it signed up to play Fresno State. The Bulldogs may have stockpiled more talent than most BCS conference teams, and they put it to good use as David Carr threw for a touchdown and ran for another in the opening game of the season vs Colorado. The Buffs actually out-gained the Bulldogs 412-287, but they couldn’t overcome four turnovers, succumbing to the Bulldogs and the eventual #1 overall NFL draft pick–David Carr. Colorado recovered with wins over Colorado State and San Jose State before taking on divisional foe Kansas State. Colorado shut down the usually high-powered Kansas State offense, beating them 16-6, thanks to Colorado’s overpowering run game buoyed by a massive offensive line that simply overpowered its opponents. An impressive 31-21 victory over Texas A&M foll0wed, but couldn’t keep the momentum going against #9 Texas, losing big 41-7. A close victory over Oklahoma State was then followed by more wins over Missouri and Iowa State. Nebraska was the class of the Big-12, thought to be on a collision course with #1 Miami for the national title, Colorado thought to be second-tier behind the mighty Cornhuskers. On national television though Colorado completely outclassed Nebraska, demolishing Big Red in their own house behind star running back Chris Brown’s 198 yards and six TDs. When the dust settled, eventual Heisman Trophy winner Eric Crouch and his Nebraska team had lost 62-36, the once unstoppable triple option attack shown to be antiquated. The iconic offense that defined generations of Nebraska teams would be scrapped after the season, and Nebraska has never regained their national prominence once expected every year, 2001 signaling the end of Big Red’s national brand. The nation was abuzz with chatter about Colorado, the team that had dismantled Nebraska, completely altering the BCS landscape, or so it was thought. Colorado had won the Big-12’s Northern Division, and the following week exacted their revenge on Texas, winners of the South Division, as again Chris Brown ran all over their foe, racking up 182 yards and three TDs, while intercepting thee passes from Texas QB Chris Simms, defeating Texas 39-37 to win the Big-12. Everyone was talking about Colorado, that unstoppable run game, that they were “a completely different team from the start of the year,” negating the two early losses. A team that had been ranked #10 skyrocketed up the polls, leaping ahead of Oregon in the BCS polls to #3, but despite outcry from many it would be Nebraska selected to play Miami in the BCS National Championship not Colorado, despite the Huskers finishing in 3rd in their own conference. The Nebraska Cornhuskers proved to be the most deceptive team in the country in 20o1, the year becoming the last gasp in their decades-long dominance of the midwest. No team exemplified”paper tiger” status more than the Cornhuskers, who despite being led by an (undeserving) Heisman Trophy winner in Eric Crouch and playing in the BCS National Championship vs. Miami, were exposed as complete frauds by Colorado, that status confirmed by Miami’s trouncing of the Huskers in the title game. In many ways, Nebraska has never recovered. The Cornhuskers opened the season with a victory over TCU, followed by a victory over surprisingly stout Troy State, the same team that would give Miami fits as well. Hosting #17 Notre Dame, Nebraska’s L-back Dahrran Diedrick wasted no time in silencing his critics, running for 133 yards and two touchdowns, leading Nebraska to a 27-10 victory. The Cornhuskers plowed through their next five games against unranked Rice, Missouri, Iowa State, Baylor and Texas Tech, winning by an average of 44 to 12. Nebraska was ranked #3 in the polls when they next faced #2 Oklahoma, the defending national champions. A close defensive battle resulted in a 13-10 score in the 4th quarter, until a 9 yard drive dealt Oklahoma their first loss of the season, putting Nebraska in the driver’s seat for the Big-12 title and national championship shot. 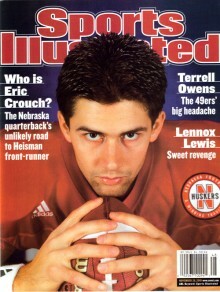 The game was highlighted by a throwback TD catch-and-run by quarterback Eric Crouch for a long score, a highlight that would get replayed almost non-stop for the remainder of the season by the media to the point of nausea, spurring Eric Crouch’s Heisman status despite more deserving players like Florida’s Rex Grossman, Miami’s Ken Dorsey, and Oregon’s Joey Harrington being the far more reputable candidates. At season’s end thanks almost entirely to this single play, it would be Crouch with the trophy, one he appeared to accept with an embarrassed look, ESPN showing four-year career stats rather than display the single-season numbers trying to validate the voting results. Following the Oklahoma victory, Nebraska was riding high, throttling Kansas 51-7 in preparation for Kansas State. In the battle with the Wildcats, Nebraska faced their first halftime deficit of the season, but a 2nd half comeback led by Crouch and Diedrick proved too much for K-State to handle. Firmly entrenched in the national title race at this point, Colorado seemed a mere blip on the radar before the inevitable showdown with Miami, but the Buffaloes didn’t treat it that way.Colorado RB Chris Brown’s nearly 200 yards rushing tore apart Nebraska’s blackshirt defense, as the Huskers yielded a whopping 62 points, a devastating loss that prevented Nebraska from clinching the Big-12 North despite Colorado having two losses on the season. It was the largest point total surrendered in the history of the program, dropping Nebraska to 4th in the human polls for the post-season. But flukes to the computer formula smiled in Nebraska’s favor, and after Colorado defeated Texas in the Big-12 title game and Oregon struggled to put away Oregon State in their finale, Nebraska and Oregon flipped in the computer standings Despite finishing third in their own conference, it was Nebraska selected to play in the national title game, not Oregon and not the Colorado team that had just beaten them. Fans and media cried foul, but the formula didn’t lie. However, Nebraska’s flaws fully exposed by Colorado, Miami took full advantage, absolutely demolishing the Cornhuskers in the Rose Bowl in a game that was over within the first five minutes. Looking almost simply happy to be there, while Oregon head coach Mike Bellotti stared on from the sidelines watching his hopes of a split-national title slip away following Oregon’s destruction of Colorado in the Fiesta Bowl, Nebraska could barely muster any fight whatsoever, losing to Miami 45-7, giving up the opening score of the game to Miami after only two plays from scrimmage. Miami forced four turnovers, completely shutdown Nebraska’s triple-option attack, and flat-out embarrassed Nebraska, leaving many to wonder aloud in hindsight if Eric Crouch’s Heisman Trophy should be revoked and it should have been Oregon playing Miami all along. The Colorado Buffs walked into Cowboy Stadium as one of the hottest teams in the country after their great upset win against Nebraska. The Ducks and the Buffs came out swinging, trading punches in the first half. To start the game Joey Harrington led a six-minute drive, capped off with a 15 yard touchdown pass to Samie Parker, the first of what would be a BIG day by Parker, reeling in 11 grabs for 185 yards and two touchdowns. Colorado countered with a touchdown dive by Chris Brown on 4th & 2 to even the score. On Oregon’s next drive, the Ducks relied on their potent ground attack, which had produced two 1,000-yard tailbacks–Maurice Morris and Onterrio Smith. After five runs for 35 yards by Maurice Morris, Smith would cap off the drive taking a sweep right 22 yards to the endzone. The score would be tied at the half 14-14 following a 33-yard touchdown strike to Colorado TE Daniel Graham, the son of legendary Oregon linebacker Tom Graham.The contest would tilt decidedly in Oregon favor following a Keenan Howry punt return, racing 88 yards for a score. 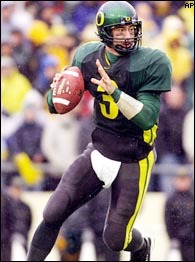 This was followed by back-to-back interceptions by Oregon, helping the Ducks seal a 35-17 victory. The Miami Hurricanes, feeling their quarterback Ken Dorsey was deserving of the trophy given to Crouch and Nebraska, exacted their revenge in the neutral site playoff to determine who would be bound for the national title game. Miami drove the field on their opening drive, resulting in a 33-yard field goal. At the end of the 1st quarter Miami struck again, on a 17-yard pass from Dorsey to Daryl Jones. The teams traded field goals in the 2nd quarter, Miami holding the edge at halftime 13-3. IN the third quarter Nebraska would strike back, thanks to a 55yard run by Diedrick, but Miami quickly countered with a lengthy drive culminated with a 1-yard plunge by Willis McGahee to retain the 10-point lead. The 4th quarter showed Nebraska’s blackshirt defense steping up, forcing a safety on the rarely-sacked Ken Dorsey, but two Miami field goals closed out Nebraska’s season, the final score 25-12. Miami, undoubtedly the most talented team in the nation, faced a scrappy Oregon Ducks team in the Rose Bowl for the BCS title. 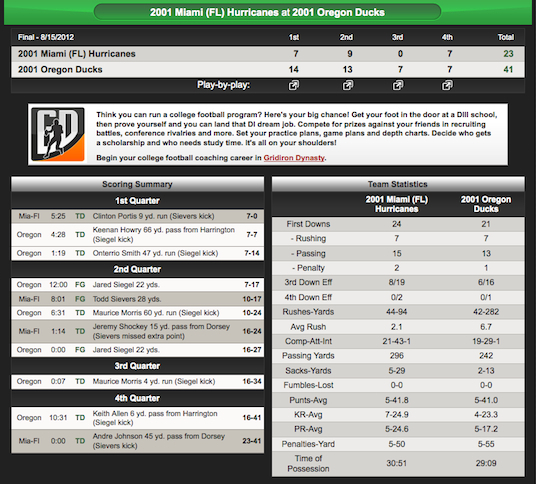 Miami jumped on the board first with a 9-yard Clinton Portis touchdown run, the Oregon defense appearing incapable of stopping Miami’s vaunted attack. Captain Comeback would respond less than a minute later though proving the Ducks were there to put up a fight, connecting on a 66-yard touchdown pass to Keenan Howry. After forcing a punt, Oregon again would break a big play, Onterrio Smith getting into the open field and sprinting for a 47 yard touchdown. The team that was supposed to be unbeatable after the first quarter was down 14-7. After trading field goals, Oregon would again strike in impressive big play fashion, this time with Maurice Morris going for a 60 yard touchdown run. The Miami defense that had held opponents in check all year appeared rusty, making errors they hadn’t all season long. 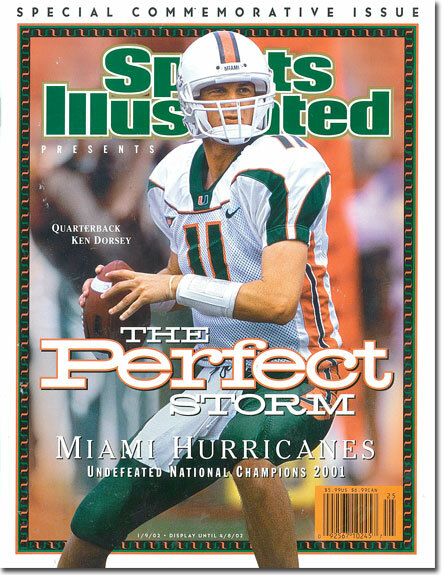 Shortly before halftime Miami cut into the deficit, Ken Dorsey connecting with tight end Jeremy Shockey for a 15 yard touchdown. Oregon hit a field goal as time expired on the half, with Miami shockingly in a world of hurt down 27-16 to the underdog Oregon Ducks. The thought-to-be undersized Oregon defense was proving their merit against a supposedly unstoppable Miami offense, and the Ducks offense proved more than capable to sustain long drives against the surprised Miami defense. The only points of the third quarter would come on a short 4-yard run by Oregon’s Maurice Morris, further expanding the lead to 34-16. The teams traded interceptions, and in passing yardage the two Heisman Trophy finalist quarterbacks were nearly identical, but it was the Oregon running game that the Miami defense has no answer for, racking up an astonishing 282 yards to Miami’s 94. In the 4th quarter Oregon again went to the air,Harrington finding receiver Keith Allen for a 6-yard touchdown. Miami was desperate, trailing now 41-16 in front of a stunned capacity crowd and millions of viewers shocked around the country watching the complete dismantling of the team that was being talked about in the media as being among the greatest of all-time. Miami would score again, a hail mary heave on the final play of the game, with receiver Andre Johnson out-leaping Oregon’s diminutive Rashad Bauman for a 45 yard touchdown, but the effort was futile. Final score, Oregon 41 Miami 23. Oregon, a trendy preseason pick out west but not that of as a legitimate candidate when pitted against the might of the SEC or ACC, proved everyone wrong. Not only did the Ducks win the national championship, but did so in demanding fashion, bringing home the University of Oregon’s first football national title.